Millet, an ancient grain is the least popular of all the other ancient grains in spite of having so many nutritional benefits. Millet is not actually a grain but its a grass seed. In ancient times millet was more widely used then rice in Asia and Africa. Slowly this ancient grain got replaced by other grains. Millet actually does not require that much water and can be grown in semi arid areas too. No wonder places like semi arid Rajasthan have bajra rotla as a part of their staple diet. Its a good source of calcium and Vitamin D so good for strong bones. Prevents anaemia. Millet is a rich source of iron and Vitamin C.
Millets like samo, thinai (foxtail millet), proso(chena, bariga,variga) and kodo millet can be cooked like rice. Its a good alternative to rice. They are also used to prepare idlis, dosa, uttapam and upma. Millets like ragi(finger millet) are usually used as porridge or malt drink. Millets like pearl millet are usually ground into flour and used to prepare flatbreads, parathas, etc. When Veena of Veena’s Veg nation suggested Millet as the #108th theme for #FoodieMonday #Bloghop, I was excited. Excited because I’m trying to include as much millet as I can in our diet. Hubby and I enjoy a light dinner as lunch is our main meal. Making something out of millet as light dinner is a great option. 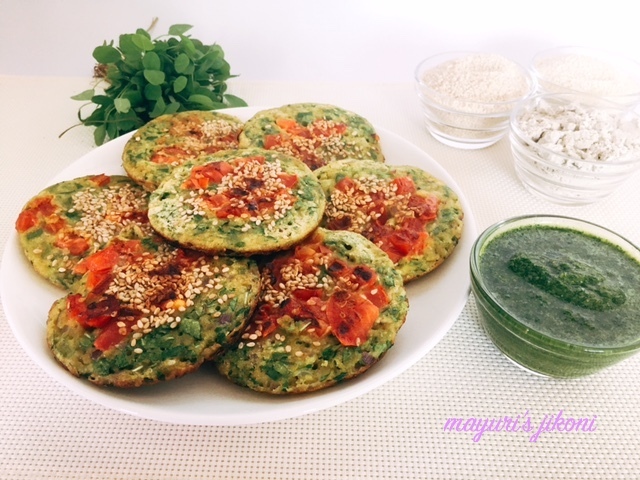 So today I’m sharing a tasty savory millet pancake recipe with you. Gluten free, easy to digest and healthy. Did I mention easy to make?? Wash kodo and samo millet in water. Soak it in water for 30-60 minutes. Put the soaked millets in a blender along with the sour yogurt. Process it till its nearly fine. Add bajri flour and mix well. Add ginger, garlic, chili pastes, salt, chopped onion, fenugreek and salt. Heat a pancake pan or a skillet over medium heat. Brush some oil over the pan. Add a ladleful or about ¼ cup of the batter onto the hot pan. Sprinkle a few pieces of chopped tomato and sesame seeds on top. Drizzle some oil around the pancake. Let it cook till becomes light golden in color at the bottom and the top does not appear wet. Flip the pancake and cook for 30-45 seconds till the tomatoes get cooked a bit. Serve hot millet pancakes with a chutney of your choice or some pickle or tomato sauce. Add any vegetables of your choice to the pancake batter instead of fenugreek. Some options are spinach, grated carrot, boiled peas, mushrooms etc. Make them thick like pancakes as I have or you may spread it out a bit to make chilas (thin crepe like). The pancakes look awesome di..healthy and colorful ! Mayuri pancake looks delicious and beautiful. Superb click. Love these cute little healthy pancakes.They look so colourful and healthy. thought I replied here 🙂 loved those pancakes and want to try them ! what a beautiful share Mayuri dee pancakes looks so perfect. Awesome share Mayuri!Bookmarking this recipe!